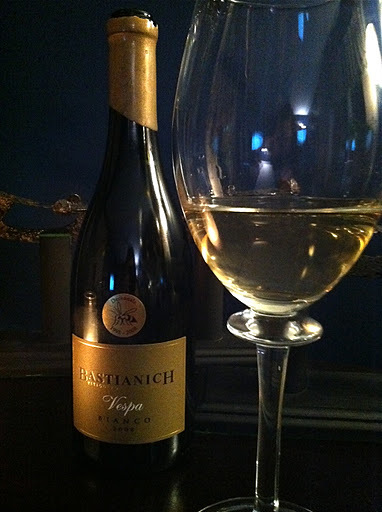 Although I’m generally a red wine girl, especially in the cooler months, I was beckoned to try Bastianich Wines since they are the brainchild of the dynamic mother and son duo of Joe + Lidia Bastianich. In addition to partnering with Mario Batali on the majority of his fantastic restaurants, Joe has published two award winning books on Italian wines, while Lidia is a much loved TV Chef and cookbook author. Bastianich Winery was founded in 1997 and has been successfully headlining native Italian varietals ever since. This sounds like the proverbial recipe for success, so I decided it made the most amount of sense to try their flagship wine first, if I fancied it, then I would move on to their other bottles down the road. Therefore, I picked up a bottle of Bastianich Vespa Bianco. Vespa means wasp in Italian, and according to Lidia Bastianich, wasps are very prevalent their vineyard as they are attracted to certain types of grapes; fittingly there is a wasp on the bottle and a clever, wax-like covering on the cork. Aromas of pretty meadow flowers and honey greeted me from the glass. Flavours of apple and honey added a touch of sweetness to each mineral charged sip. The body was surprisingly hefty for a white wine and provided ample room for the lengthy, slate finish. As I was enjoying my second glass the fusing of fruit and minerals was reflective and refreshing and came to the forefront. The clean and snappy acidity made me consider the necessity of adding some goat cheese to my already yummy grilled portabellos with guacamole. Bright and crisp, this is quite a delectable bottle. That looks so tasty… and I really love the appearance of the bottle. it was quite refreshing :)and peeling off the wax seal on the bottle was a fun time!